Content – Art’s point, significance, meaning, subject or theme, function, what it’s about in the largest sense. Form – when we look at a work of art we see its form. Form is the vehicle or the way art moves us to meaning. The more the proportion of emphasis on idea and form approaches a state of equilibrium, the more eloquently will the work reveal what is called content. Content, as opposed to subject matter, is that which a work betrays but does not parade. There are a wide variety of methods for looking at art, taking into account learning styles and age appropriateness. These methods organize questions and information logically, providing a framework for looking at works of art. Generally, these questions begin with the basics – materials, methods, content; go on to more deductive questions – what does it mean, why did the artists make the choices he/she did; and concludes with aesthetics, value judgments and emotional response to the artwork. 1. Description – identifying what can be seen: elements and materials – describe the visual and literal qualities. Art Historically deals with where, who and when. Be objective. 2. Formal Analysis- how is this put together physically and compositionally and identifying style or subject matter. What relationships do the elements sustain? 3. Interpretation – Why did the artists make the choices he did about materials, composition, subject matter, etc.? What is he/she trying to say? Is there an emotional tone? 4. Evaluation/Judgment – How does this compare with similar works? Did the artist make the right decisions? Does the work say what he wanted to say? Is the work of high quality? What do you think the artist could improve on? Does the work communicate significant ideas or arouse emotions? Etc. Feldman’s method is used by the Manhattan public schools and it is important to become familiar with it. It is a good method because it begins with answerable questions first – no one is put on the spot. The second set of questions – the formative – use the answers from the first set. Interpretation questions are based on the objective answers but allow for opinions. There are no right or wrong answers, although there may be accepted views. Finally, after the audience is comfortable there are subjective questions about how successful the work is. Most other methods are loosely based on this organization. Name and describe what you see – objects, spaces etc. Materials – what is this made out of? how is it made? Classify the elements – lines, shapes, textures. Find examples of repetition, rhythm, etc. Where is the focus and how is it achieved? What kind of spatial devices are used to create dimensionality? What is the relationship of the figures to each other? Is there a possible theme? How do the parts of the painting contribute to this theme? Is there any symbolism? When do you think this was painted and why? Is the work in an identifiable style? Evaluate the craftsmanship and technique. Are parts of the work successfully interrelated? Is it aesthetically pleasing? Do you like it? Does the work communicate significant ideas, related to human behavior? Does it illicit a response? assumed that criticism will be part of Interpretation. and analyzing it formally 2. Deduction: What can you figure out by asking questions? 3. Speculation – What does it all mean? Questions are broken down into: Sensory properties, Formal properties, Expressive properties. answer questions first to be a better icebreaker. intelligences (Howard Gardner) into account. Game. See handout on Project Muse This game is particularly good with younger children. Experiential. These take into account different learning styles and provide a variety of ways to look at art. See handout on Project Muse. great deal of research on how various questioning methods work with a variety of learners. A series of 10 questions which serve as learning tools, using external/physical questions first and builds on previous information to get at the internal meaning. No prior information is needed to play the Generic Game. See handout on Project Muse This game is particularly good with younger children. Uses five entry points to approach a work of art: Aesthetic, Narrative, Logical Quantitative, Foundational, Experiential. These take into account different learning styles and provide a variety of ways to look at art. See handout on Project Muse. Do you like this work of art? Why or why not? Look carefully at the work of art in front of you. What colors do you see in it? Take turns listing the specific colors that you see (for example: “I see red.” “I see purple.”). When you’ve run out of colors, move on to question two. What do you see in the work of art in front of you? Take turns listing the objects that you see (for example: “I see an apple.” “I see a triangle.”). When you’ve run out of objects, go on to question three. What is going on in this work of art? Take turns mentioning whatever you see happening, no matter how small. When you can’t find anything more, move on to question four. Does anything you have noticed in this work of art so far (for example: colors, objects, events) remind you of something in your own life? Take turns answering. When you run out of responses, move on to questions five. Is this work of art true to life? How real has the artist made things look? Please remember that there are no right or wrong answers in this game. What ideas and/or emotions do you think this work of art expresses? As soon as you are ready, move on to question seven. Do you have a sense of how the artist might have felt when he or she made this work of art? Does it make you feel one way or another? Whenever you are ready, move on to question eight. Take a look at the other works of art displayed around this one. Do they look alike? What is similar about the way they look (for example: objects, events, feelings, the way they are made)? What is different? Please move on to question nine. Think back on your previous observations. What have you discovered from looking at this work of art? Have you learned anything about yourself or others? As soon as you’re ready, move on to question ten. What would you have called this work of art if you had made it yourself? Does the title of the work, if there is one, make sense to you? Do you like this work of art? Why or why not? You may notice that this is the same question that you were asked before you played the game. Has your reaction to the work changed? Do you like it more or less than you did in the beginning? Why? 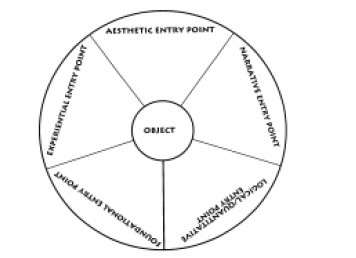 The Aesthetic Window – The entry point through which learners respond to formal and sensory qualities of a subject of work of art. For example: the color, line, expression, and composition of a painting. Questions: How would you describe the lines that you see? What colors do you see in this work of art? Does what you see seem balanced or off-balance? What emotions appear to be expressed in this work of art? Describe this object in detail. The Narrative Window – The entry point through which learners respond to the narrational elements of a subject or work of art. For example, the legend depicted in a painting. Questions: If this work of art tells a story, who or what is the main character? When and where did the story take place? Tell the story. Give the work of art a title. Write the story of what you see. The Logical/Quantitative Window – The entry point through which learners respond to aspects of a subject or work of art that invite deductive reasoning or numerical consideration. For example, the question of what decision lead to the creation of an art object. Questions: Do you think there is any part of this work that ties the whole thing together? What do you think the artist did first in making this painting? Why do you think this work of art is the size that it is? How can you determine the age of this work of art? Make a list of questions about what you see. The Foundational Window – The entry point through which learners respond to the broader concepts of philosophical issues raised by a subject or work of art. For example, why a modern painting of soupcans is considered art. Questions: Is this art? Why? Why do we look at art? Is it still art if it is not beautiful or makes you feel uneasy? How might this work change the lives of people who see it? Tell why you think this work is or is not important. The Experiential Window – The entry point through which learners respond to a subject or work of art by actually doing something with their hands or bodies. For example, manipulating the same materials used in a work of art. Questions: Can you write a poem about what you see? Can you make a (group) statue of what you see? A dance, a song? Can you make a collage using the elements from this work of art? Sketch this work of art. Create something based on what you see. students a chance to try production methods. There may be situations where the Museum exhibits objects rather than visual art. When this situation arises, we will do some work with material culture – in the meantime, the handout on material culture will show you how to modify your looking. 1. Art Historical – evaluation of art by material cultural means. 2. Symbolic – the role held by an object in society. 3. Cultural – the development of characteristics of an object which can be related to particular cultures. 4. Environmental – the role of the physical environment on objects. 5. Functionalist – the way an object is used. 6. Structuralist – how an object was physically made. 7. Behaviorist – the interaction of the object and behavior patterns of society. 8. Community – the interaction of the object and society which forms/reflects a common viewpoint/character. – the products of human activity determined by the habits (culture) acquired by man as a member of society. 1. Explains why things were made. 2. Explains the forms things to ok.
3. Explains the need things served: social, functional, symbolic, and aesthetic. You can use the above models when looking at art. For instance, Curry’s “Our Good Earth” might be interpreted as follows: The work was used as a poster to sell war bonds (Behaviorist)and as a form of propaganda (Functionalist). The farmer represented the strong Protestant work ethic being touted by the American government of the time (Community). 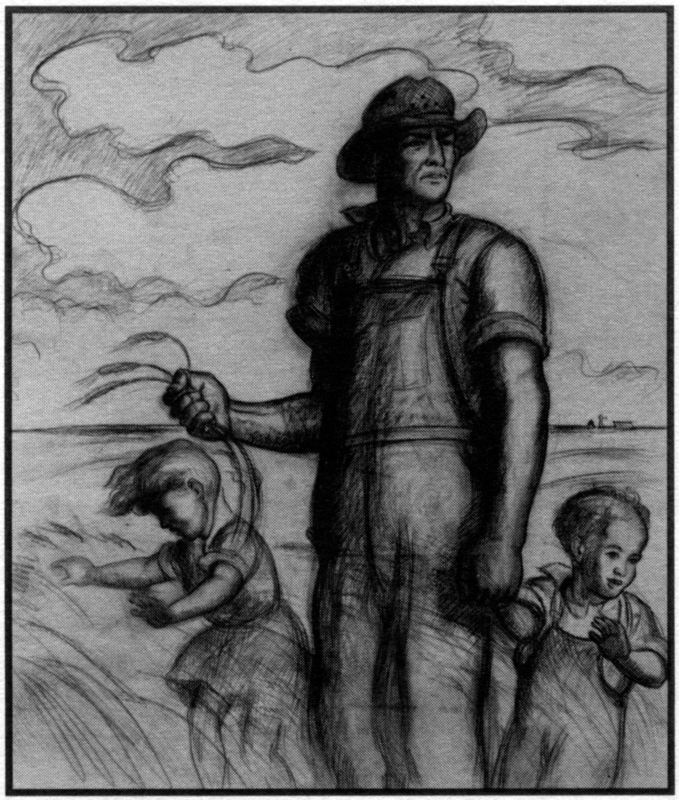 He symbolizes strength and family values (Symbolic) It is a work in the Regionalist style, impacted by the landscape of the Mid-west (Cultural and Environmental). Criticism – The interpretation and analysis of art. Humanities – The evaluation of human knowledge, experience and values. Includes the study of history, arts, languages, ethics, philosophy, and archaeology. Interpretation – The way things are understood. In a museum, it is the job of the educators or docents to help interpret the objects to the public. Interpretation is subjective, formed by the perceptions (mental baggage) of the observer. Perception – Awareness of the world around us, based on the senses, past experiences, intelligence and attitude.